The sun is setting as we leave Cadillac Ranch. I notice something slung over a barbed wire fence between two spray-painted trash bins. As we get closer, I see that it was the hide of an animal. On first glance you can see it is fresh. Why is it here and what type of animal could this be? To find answers, I reached out to the National Park Service who suggested it might be a coyote pelt. 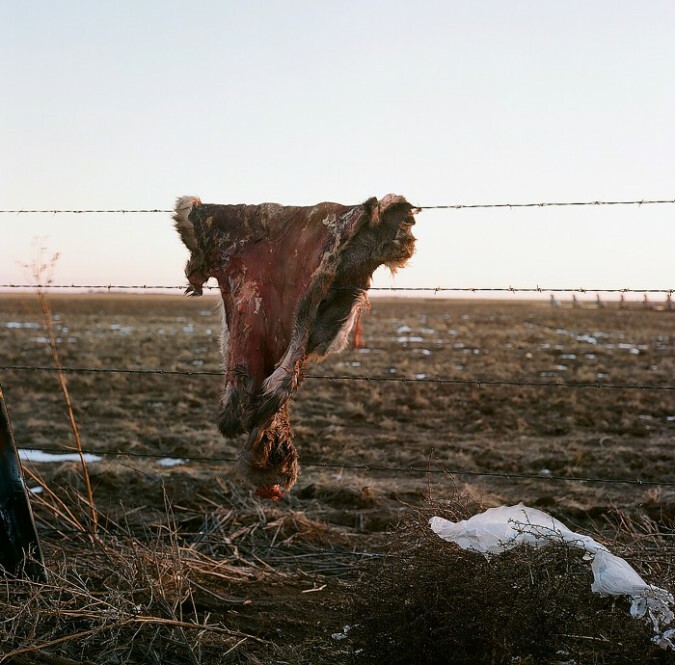 Ranchers will kill coyotes and hang the hide on a fence in the assumption it will deter other predators from visiting the same area. In addition, I also reached out to the Texas Cooperative Extension Wildlife Services, who suggested it might be part of a deer hide. Texas Wildlife Services explained that coyote fur is longer and more light brown to tan in color with no white, whereas the hair on this hide looks thick and has the same coloring (grey, brown, black) as that of a deer. You can also see white patches that are identical to the hide from a deer underbelly. The conclusion the Texas Wildlife Services made was that since I found it near trash cans, a scavenger (crow, vulture, coyote) took the animal hide from the trash thinking they could make a meal of it. However, could an animal neatly lay the hide over a barbed wire fence and why what was the hide doing in a trash bin?